For me personally, Just-dice is one of the best designed dice sites out there. I can always find whatever I need immediately, without having to dig around in menus and sub menus for something. The buttons and settings are logically organized in the tabs on the site, and almost no action requires more than 4 clicks to perform. The roll controls and user statistics are easily accessible, always visible and easy to understand. The controls aren’t cluttered with unnecessary controls. It shows just what you need. Just dice does throttle smaller bets, but when betting larger amounts the bets are extremely fast and the site UI is very responsive and does not lag at all. I have no complaints about the speeds of just-dice. The speed limitations of bets can be found in the FAQ page of just-dice if you would like some more information on it. There is no official API available for just-dice. A third party custom API (JDCAPI) was written by yours truly and can be found at https://github.com/Seuntjie900/jdcapi, along with some example projects on implementing JDCAPI.Just-Dice runs on node.js and implements a socket.io websocket connection for communication. If you do not feel like using JDCAPI to develop your bot/program, then you might be able to utilize this information. The just-dice community is a close knit and dedicated group op people, with most of the mods being around since the site opened in 2013. There are a few community driven chat bots that run on the site as well, like the inudash bot, for converting between currencies and similar actions and the X Rainman bot to rain on active chatters. There's also a trivia bot that holds trivia competitions in the chat with clam prizes and every now and then, a new bot pops in.The people in the chat are usually friendly and helpful to new users and can be pretty fun to chat with. There are always a few rotten apples in the bunch, but don't let them discourage you from using just-dice, most of the users are pretty decent. Dooglus is a long standing trusted member of the bitcoin community, especially in the bitcoin gambling scene. He has contributed to the bitcoin core code and was involved in an in depth analysis of satoshi dice before launching just-dice.He takes a kind but no-nonsense approach to running just-dice. He seems to care highly for his clients and the community of just-dice and constantly improves on the site to keep the community happy. He also listens to community and investor feedback and takes it into consideration as he operates just-dice.Dooglus seems to be the most trustworthy dice site operator in the crypto currency gambling community to date. Just dice is one of the oldest dice sites around. It was started in June of 2013 and is the first online casino to feature a crowd funded bankroll. Dooglus was the first to implement the invest feature, which allows users to “invest” in the site bankroll and reap the profits of the casino, according to the size of their investments.After a few months of operating, Just-Dice had a bank roll of more than 60 000 Btc. 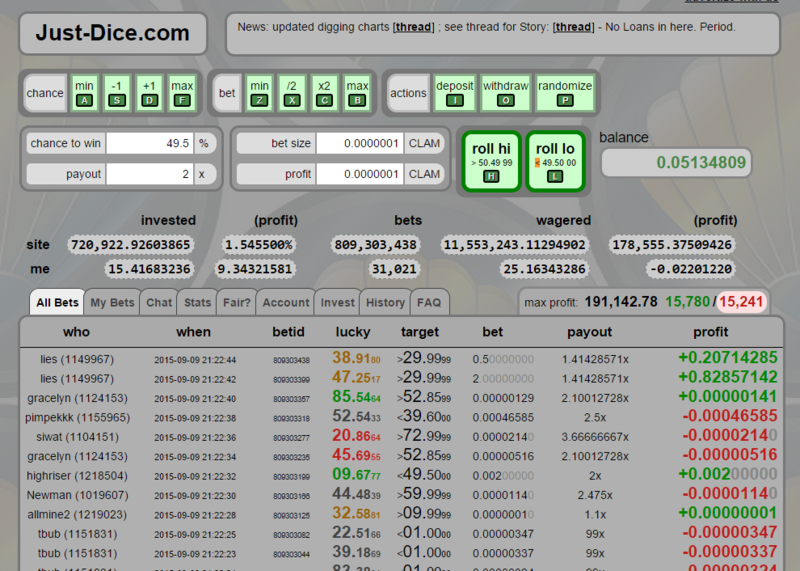 And an amazing max profit of more than 600 Btc. This bankroll dwindled a little over the coming months, until eventually dooglus announced that he’s closing the casino. He was uncomfortable with holding that much of other peoples’ money. Almost all of the 30k invested bitcoin was successfully withdrawn, with the exception of a few users that forgot about their coins or could not access their accounts any more. A few months after closing (about 5), just-dice was re-opened with Clams instead of Bitcoin. Since then, just-dice has been a massive driving force behind the Clam price and support, with more than 720 000 invested Clams (at the time of writing) and a remarkable max profit of 178 885 Clams (at the time of writing), worth 1085Btc! (at the time of writing).If you’ve got a few clams to play with, Just-dice is definitely the place to do it! This page doesn't have any comments yet ;(. Click on the Make a comment button to the right to make a comment.